"Chris Forsyth & Koen Holtkamp have travelled similar paths in their respective careers, each earning reputations as fierce, creative artists and respected masters of their instruments (guitar & synthesizers, respectively). They first came together for “Early Astral” in 2012 (released in the UK by Blackest Rainbow), and that album’s two side-long tracks showed Forsyth & Holtkamp upping their game in new & exciting ways. Neither are strangers to collaborative work (Holtkamp with Mountains and Forsyth with Peeesseye and his Solar Motel Band), and something clicked between them. Forsyth stretched his guitar’s sounds into simultaneously weirder & more Kosmische psychedelic directions, while Holtkamp seemed to loosen up a bit, shrugging off the stately minimalism he’s primarily known for. 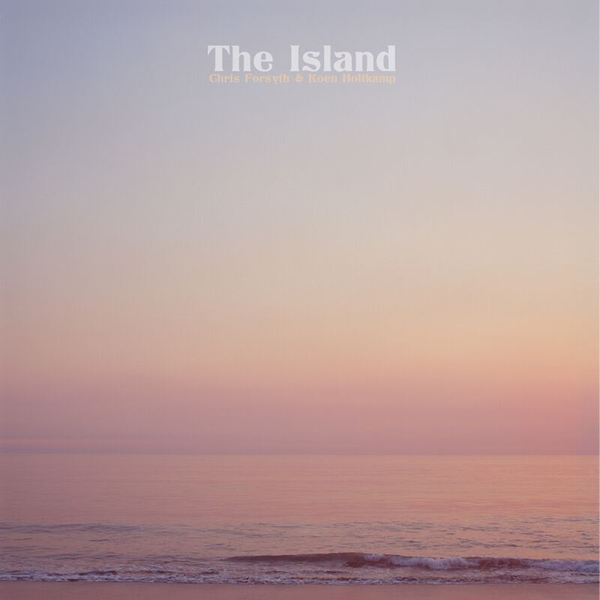 “The Island” is the second collaborative album from these Philadelphia and Brooklyn-based musicians and unlike “Early Astral,” which was developed over the course of a year’s worth of rehearsals, “The Island” was recorded far more spontaneously. Rehearsals for the sessions amounted to spending a couple days drinking wine, cooking, and hanging out on the beach at the Jersey Shore, and the rhythm and motion of the water seems to have had an undeniable effect of the session's results. Both brought sketches or patches of ideas to the sessions, but the album was essentially conceived in the studio over the course of two days in Philadelphia with engineer Jeff Zeigler (The War on Drugs, Kurt Vile, Purling Hiss, Nothing, etc. ), constructed from the ground up, piece by piece and layer by layer. Forsyth describes what you hear as “the birth of these compositions”. The result is an album that despite the freewheeling nature of it’s origins, sounds thoroughly composed & song-oriented. Songs like “Long Beach Idyll” and “Cosmic Richard” fuse Forsyth’s desert-dusted guitar & Holtkamp’s cascading electronics into airy, blissful meditations afloat on an endless ocean, while “Sun Blind” and “Alternator” crackle with intensity, with both musicians seemingly coaxing each other towards something new and primal." Clear vinyl LP, includes free download code.